What is your talkbox story? My history with the talkbox is relatively recent. I’m a producer and DJ for 10 years now; my first LP using the Talkbox was “Plan B” with Latex Diamond in 2006. I was always attracted to the talkbox sound, but in Spain, talkboxes aren't sold as instruments, so searching the information about how it works wasn't easy. In just a few months I made several prototypes until it sounded as I imagined. Since then, I’ve used it in almost all my productions. The talkbox projects myself internationally. My talkbox is handcrafted - I use a driver with a tubeholder, and Crat Power Block amplifier. 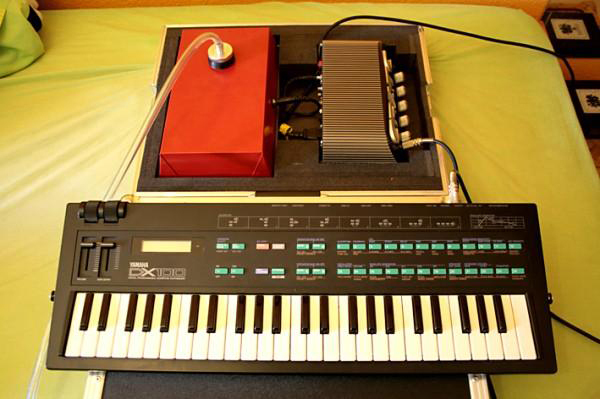 I use a Yamaha DX100 keyboard. I'm very satisfied with my customer made system, in fact I don’t think to buy a manufactured talkbox. What are your opinions on the GF WORKS TubeHolder ? I’m really pleased with my tubeholder, as I told my system is handmade, and in my last model, I’ve configured the driver tube in a very rustic way. So when I discovered the GF Works tubeholder and I fixed it to my talkbox, it worked perfectly with the driver. It's the best solution to people customizing their talkboxes. What do you think of GF WORKS web site? This site is the only site on the web that is serious and complete for the lovers of the talkbox. My talkbox worked before I met the site, but I got it to a further level. Thanks to the tubeholder that completed my talkbox and thanks to all the information on the website for resolving any doubts about talkboxes. I think that the proliferation of Talkboxers in the recent years is thanks to sites like this one, and all the information that you share on Internet. If I have to recommend a website to somebody that is new to the talkbox, this is the perfect website. Here you can find all the necessary information to start your talkboxing career and the rest depends of you! I’m working with Latex Diamond and Mitsuruggy on their latest works. I recently premiered a video“I Like IT” as a director and I hope to make more soon. You can hear my talkbox in the latest LP of Ms. Krazie. I’m working on a several Mixtapes as DJ, and I think to throw out some other works and collaboration works - both in my country and internationally next year. I would really like to focus on releasing a solo album as a Talkboxer. Sholo Truth is a Producer, DJ, Talkboxer and MC born in 1983 based in Madrid, Spain. He is considered one of the best producers in Spain and pioneer on the use of the talkbox. He started his career as a self-taught musician at the end of the 90’s. Lover and collector of Black Music, he is also open to all kinds of music that like his ears. Partner and founder of his own Label Uglyworkz Ent, he is also one of the official producers of Mitsuruggy and Latex Diamond, two spanish MCs, who he shared his adolescence years.